Urban delivery firm Gnewt Cargo, which claims to run the UK’s largest all-electric delivery fleet, has been acquired by logistics specialist Menzies Distribution. 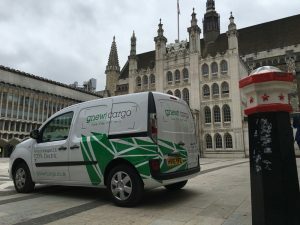 Founded in 2008, Gnewt Cargo runs around 100 electric vans to carry out final-mile delivery services in central London for retailers, e-tailers and parcel carriers such as Hermes and TNT. Earlier this year the firm was granted £1.1m government funding to lease 33 electric vehicles to perform last-mile logistics. Menzies said the acquisition, made for an undisclosed sum, underpins expansion plans for its parcel consolidation services and will also enable it to offer greener delivery solutions for its existing customers. Managing director Greg Michael said: “Everyone recognises that goods need to be moved in and around congested city centres. The Gnewt model shows it can be done successfully whilst minimising environmental impacts. “This acquisition gives us a stronger, cleaner presence in the London market. and with our national reach, gives us a platform to introduce all-electric distribution to other city centres in the UK.”For more industry latest news, click here.